This is a transitional exhibition in Florence’s career. When I first met her, her major skill lay in drawing. For the last three years, she has been active working on relief sculpted clay and plaster to create large glass panels and bronzes. She is still coming to terms with these changes both in subject matter and materials and this exhibition is a glimpse of what may come after this artistic transformation. I, as a commissioned artist, had been asked by the architectural team, to identify Kenyan artists to work on various commissioned projects for the Sacred Heart Cathedral in Kericho. I thought that there would be many artists eager and willing to get involved in this project, I was wrong. I found it very difficult to find people who would be prepared to rise to the challenge of working on commissioned art works. I met few artists with the skill set or the ambition to step out of their comfort zone and confront a difficult design challenge. I first became aware of Florence when I saw one of her drawings in a mixed exhibition in the Muthaiga Club, curated by Carol. I saw in the drawings of Florence a draughtsman of great quality and an understanding of pictorial depth. At that time, there were two parts of the project that I was looking to allocate. A series of glass relief sculpted panels depicting the Stations of the Cross and a series of relief sculpted panels for the main doors of the cathedral which would either be made of sculpted glass or bronze. In the event we were able to make bronze panels. Carol arranged a meeting with Florence at the One Off gallery. After talking her through the project I asked which part of the project she would like to consider, she said, “I want to do all of it.” So began a collaboration which has carried on over almost three years. 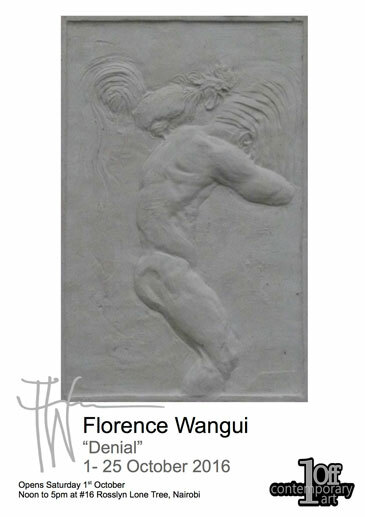 Florence had a very limited experience in working with clay and the art form of relief sculpture. It was very difficult to find clay for that purpose here in Kenya. At the beginning there was a gradual progression from scale design, into full sized drawing, into relief sculpture. I was astonished at how quickly she developed her technique and the progress she made and continued to make throughout the sculpting process. She used the clay as 3D drawing. It was important at a reasonably early stage to look at what we were designing for, so from one of the first drawings, Florence was confronted with making a section of one door panel and a detail from one “Station of the Cross” panel using clay. These first clays were cast and turned into a material suitable for kiln casting or lost wax for bronze casting. At the time I met Florence, we were still not sure if the main cathedral door panels would be made in glass or bronze. I had originally searched for someone who could make such panels but found no one who either could or would make them. We therefore thought that the door panels would be made of glass. The sculpting process would be the same. Requested by the clients, I looked again for a possible workshop where such bronze panels could be undertaken. A chance meeting in Village Market led me to a recently opened studio in Ridgeways owned by Rajinder Kumar Anand, he had just completed a large bronze sculpture for Kenyatta University and was delighted to work with us. Over several months Florence grew in confidence in her ability to render these difficult themes in an almost Romanesque pictorial directness, a whole theme contained within relatively small bronze panels. I was astonished on each of my visits to Kenya to watch her development. The brief had since expanded for the Stations of the Cross themes, to the 14 panels for the interior of the Cathedral, 14 panels for the exterior were added. The panels for the interior were to be coloured negative relief sculptures, the relief being on the back of the glass. For the exterior, the panels would be positive relief sculptures made of float glass, subsequently sandblasted. I have been amazed and delighted to see how professionally and with such artistic integrity Florence has approached these challenges that we have encountered. I have been a commissioned artist all of my working life. Not all artists can or want to work to commission. It is about solving design and technical problems as much as the art work. If Florence chooses to, then she has all the ability to deal with whatever artistic challenge that comes her way. There have been many challenges involved with working on these projects, many new skills needed to be learned. The work is very physical, a mould for the largest glass panes weighs around 70-100kg. These moulds have to be poured, dried and prepared. The glass has to be fired in preparation. The coloured crushed glass has to be worked in the kiln directly on the mould, then the whole thing fired and fused. Florence has been active in all of these processes. Both Florence and the project as a whole also could not have completed these works without the fantastic input from Studio Propolis. The Kericho project is now almost completed, but I set one final challenge. To help complete a set of lino cuts that will be used to make small scale figurative panels for the chapel of the Cathedral. Another new technique. She has also proved herself more than capable of working in this new medium. Few artists are ever given the chance to create what she has created. How many artists in a lifetime have the opportunity to create a set of bronze panels for a Cathedral door and a set of 28, 2mt glass panels. Florence has done this in her 20’s. What does that do to an artist? For me, over the years, I have become used to and take great pleasure in working with new materials and different design approaches and techniques. Florence has a huge potential and it will be fascinating to see how she reacts to future challenges.